As Rhône-style wines continue to gain in popularity, a handful of Colorado winemakers are having great success with Syrah, both as a varietal or a blend. One winery in particular, Canyon Wind Cellars, consistently produces one of my favorites from the state. 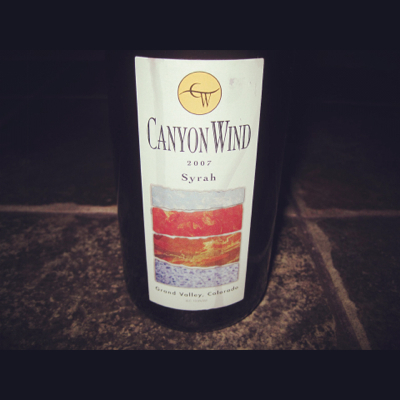 Their minimalist approach to winemaking, combined with the excellent Colorado terroir, makes the Canyon Wind 2007 Syrah a must try. Planted in 2001, the first vintage debuted in 2005 and continues through the present. The cliffside vineyard wine is a 100% Syrah. Rich and spicy, the full-bodied wine is a treat with hearty meats. Highly recommend.